Background: Results of randomized controlled trials evaluating zinc for the treatment of the common cold are conflicting. We conducted a systematic review and meta-analysis to evaluate the efficacy and safety of zinc for such use. Methods: We searched electronic databases and other sources for studies published through to Sept. 30, 2011. We included all randomized controlled trials comparing orally administered zinc with placebo or no treatment. Assessment for study inclusion, data extraction and risk-of-bias analyses were performed in duplicate. We conducted meta-analyses using a random-effects model. Results: We included 17 trials involving a total of 2121 participants. 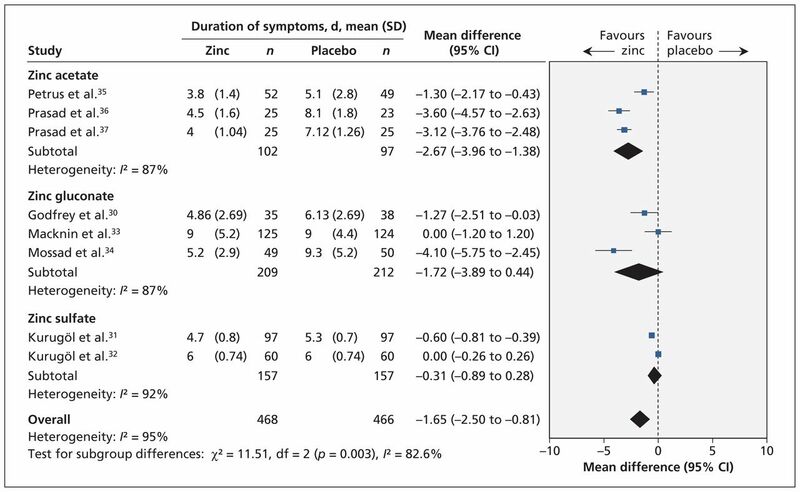 Compared with patients given placebo, those receiving zinc had a shorter duration of cold symptoms (mean difference −1.65 days, 95% confidence interval [CI] −2.50 to −0.81); however, heterogeneity was high (I2 = 95%). Zinc shortened the duration of cold symptoms in adults (mean difference −2.63, 95% CI −3.69 to −1.58), but no significant effect was seen among children (mean difference −0.26, 95% CI −0.78 to 0.25). Heterogeneity remained high in all subgroup analyses, including by age, dose of ionized zinc and zinc formulation. The occurrence of any adverse event (risk ratio [RR] 1.24, 95% CI 1.05 to 1.46), bad taste (RR 1.65, 95% CI 1.27 to 2.16) and nausea (RR 1.64, 95% CI 1.19 to 2.27) were more common in the zinc group than in the placebo group. Interpretation: The results of our meta-analysis showed that oral zinc formulations may shorten the duration of symptoms of the common cold. However, large high-quality trials are needed before definitive recommendations for clinical practice can be made. Adverse effects were common and should be the point of future study, because a good safety and tolerance profile is essential when treating this generally mild illness. A recent meta-analysis of randomized controlled trials concluded that zinc was effective at reducing the duration and severity of common cold symptoms.11 However, there was considerable heterogeneity reported for the primary outcome (I2 = 93%), and subgroup analyses to explore between-study variations were not performed. The efficacy of zinc therefore remains uncertain, because it is unknown whether the variability among studies was due to methodologic diversity (i.e., risk of bias and therefore uncertainty in zinc’s efficacy) or differences in study populations or interventions (i.e., zinc dose and formulation). We conducted a systematic review and meta-analysis to evaluate the efficacy and safety of zinc for the treatment of the common cold. We sought to improve upon previous systematic reviews11–17 by exploring the heterogeneity with subgroups identified a priori, identifying new trials by instituting a broader search and obtaining additional data from authors. We included studies if they were randomized controlled trials; involved patients of any age with the common cold; and compared oral zinc treatment started within three days of symptoms with placebo or no intervention. We excluded studies in which zinc was administered intranasally or that used zinc in a combined formulation with other minerals or vitamins. The primary outcome was the duration of cold symptoms. Secondary outcomes included the severity of cold symptoms, the presence of symptoms after three and seven days, and adverse events. We searched MEDLINE (1948 to Sept. 30, 2011), Embase (1980 to 2011 [week 40]), the Cochrane Central Register of Controlled Trials (until the third quarter of 2011), CINAHL (1982 to Sept. 30, 2011) and AMED (Allied and Complementary Medicine Database) for relevant studies. Details of the strategies used to search these databases are provided in Appendix 1 (available at www.cmaj.ca/lookup/suppl/doi:10.1503/cmaj.111990/-/DC1). No restrictions were placed on year or language. We also searched conference proceedings from 2005 to 2011 through the Web of Science and Open-SIGLE databases, and clinical trial registries (ClinicalTrials.gov, Current Controlled Trials [controlled-trials.com] and the US National Institutes of Health database). Finally, we reviewed reference lists of key articles. Two reviewers (J.J. and M.S.) independently screened the titles and abstracts of identified studies. All potentially relevant articles were then obtained and screened independently for eligibility. Disagreements were resolved by consensus or third-party adjudication. Study authors were contacted for information when required (Appendix 2, available at www.cmaj.ca/lookup/suppl/doi:10.1503/cmaj.111990/-/DC1). Statistical analysis was conducted using Review Manager Software (RevMan, version 5.1).22 Data were pooled using a random-effects model. For continuous outcomes, we used mean differences to pool results when the measurement scale was the same (duration of cold symptoms) and standardized mean differences when the scale varied (symptom severity). Risk ratios were used for dichotomous outcomes. Heterogeneity was evaluated using the I2 statistic. When substantial heterogeneity was found (I2 ≥ 40%), subgroup analyses were performed. We performed subgroup analyses defined a priori to investigate the effects of age (< 18 years v. ≥ 18 years), experimentally induced versus naturally acquired colds, zinc formulation, daily dose of ionized zinc (≥ 75 mg v. < 75 mg), high versus low risk of bias, timing of treatment initiation (< 24 hours v. ≥ 24 hours) and funding source (industry v. non-industry). Interaction tests for subgroup differences were performed using the χ2 test and the I2 statistic. Subgroup credibility was assessed using the criteria described by Sun and colleagues23 (Appendix 3, available at www.cmaj.ca/lookup/suppl/doi:10.1503/cmaj.111990/-/DC1). Given the potential differences between naturally acquired and experimentally induced colds, we performed a sensitivity analysis in which we excluded trials with induced colds. We screened the titles and abstracts of 683 unique records identified through our literature search. 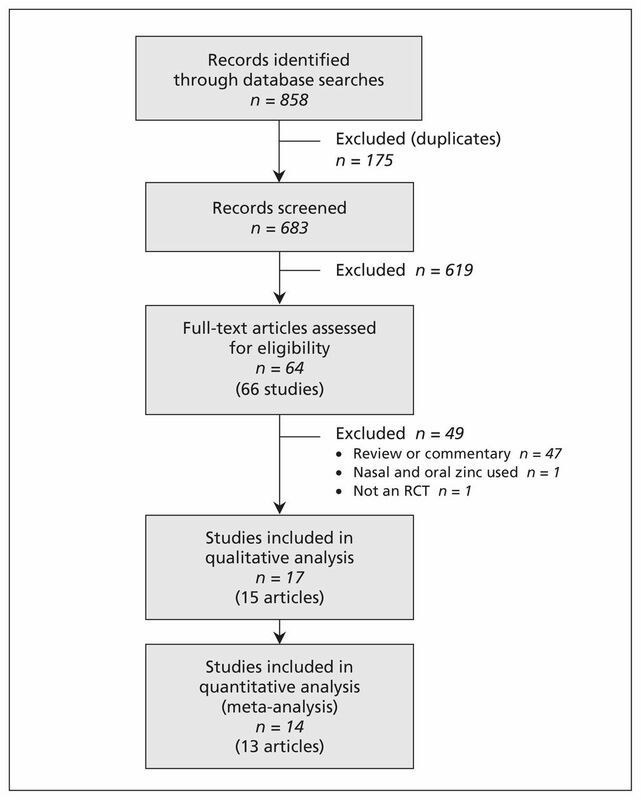 Of the 64 full-text articles assessed for eligibility, 17 studies were included in the systematic review and 14 in the meta-analysis (Figure 1). The kappa value for agreement between the reviewers was 0.96. Two trials presented in one paper included three zinc treatment arms and one placebo arm.24 In order to avoid a unit-of-analysis error,25 the three zinc arms were combined and compared with the one placebo arm. Selection of studies for the qualitative and quantitative analyses. RCT = randomized controlled trial. Seventeen trials involving 2121 patients ranging from 1 to 65 years of age were included (Table 1).24,26–39 Three trials included children less than 18 years old, 13 included adults, and 1 trial included both adults and children. Colds were either naturally acquired (13 trials) or experimentally induced (4). Treatment regimens included zinc gluconate lozenges (8 trials) or tablets (1), zinc acetate lozenges (4), zinc sulfate syrup (2), and either zinc gluconate or zinc acetate (2) compared with placebo. The duration of treatment was different in all trials (range 3–14 days or until symptom resolution). The findings of our risk-of-bias assessment are presented in Table 2 (and Appendix 4, available at www.cmaj.ca/lookup/suppl/doi:10.1503/cmaj.111990/-/DC1). Most of the trials did not provide adequate information on allocation concealment. All of the trials reported blinding of patients and health care professionals with placebos identical in appearance or with no identifying features. The risk of bias is summarized for each outcome in the GRADE Evidence Profile (Appendix 5, available at www.cmaj.ca/lookup/suppl/doi:10.1503/cmaj.111990/-/DC1) and in Table 3. Thirteen trials reported on the duration of cold symptoms. The remaining four trials either measured but did not report the outcome26,29 or reported the proportion of symptomatic patients on each day.38,39 Eight trials (n = 934) could be pooled in the meta-analysis (Figure 2). All trials involved patients with naturally acquired colds. Treatment with zinc compared with placebo significantly reduced the duration of cold symptoms (mean difference −1.65 days, 95% CI −2.50 to −0.81). Because of significant heterogeneity (I2 = 95%), however, the quality of the evidence for this finding was considered moderate (Table 3, Appendix 5). Meta-analysis of the duration of cold symptoms, by age, in randomized controlled trials of oral zinc therapy for the common cold. A value less than zero indicates a benefit from zinc. CI = condifence interval, df = degrees of freedom. Subgroup analyses showed a statistically significant interaction between trials involving adults compared with those involving children (interaction p < 0.001) (Figure 2) (Appendix 6, available at www.cmaj.ca/lookup/suppl/doi:10.1503/cmaj.111990/-/DC1). Zinc reduced the duration of cold symptoms in adults (mean difference −2.63, 95% CI −3.69 to −1.58) but not in children (mean difference −0.26, 95% CI −0.78 to 0.25). Heterogeneity was slightly reduced in this subgrouping (adults: I2 = 82%; children: I2 = 84%). The reduction in the duration of cold symptoms was greater with high doses of ionic zinc (mean difference −2.75, 95% CI −3.89 to −1.60) than with lower doses (mean difference −0.84, 95% CI −1.50 to −0.18) (Figure 3) (Appendix 6). There was a significant interaction effect (p = 0.005), and heterogeneity was reduced (high dose: I2 = 78%; low dose: I2 = 89%). 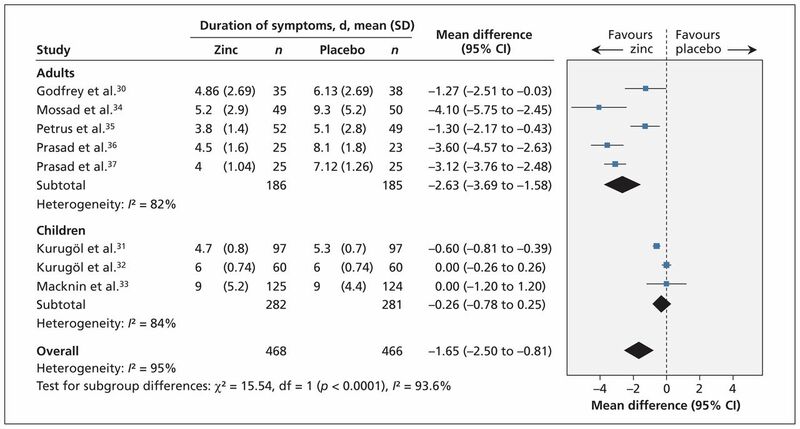 Meta-analysis of the duration of cold symptoms, by dose of ionic zinc, in randomized controlled trials of oral zinc therapy for the common cold. A value less than zero indicates a benefit from zinc. CI = confidence interval, df = degrees of freedom. 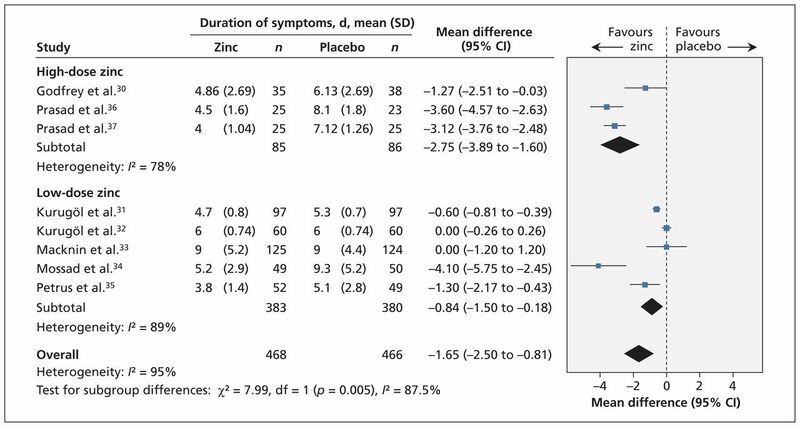 The effect of zinc on the duration of symptoms also varied by zinc formulation (interaction p = 0.003) (Appendix 6). The duration of symptoms was significantly reduced in trials using zinc acetate (mean difference −2.67, 95% CI −3.96 to −1.38) but was not different in trials using zinc gluconate or zinc sulfate (Figure 4). This subgroup effect may reflect the fact that zinc acetate was used only in adults and zinc sulfate only in children (Appendix 3). Meta-analysis of the duration of cold symptoms, by zinc formulation, in randomized controlled trials of oral zinc therapy for the common cold. A value less than zero indicates a benefit from zinc. CI = confidence interval, df = degrees of freedom. No subgroup effect was found for differences in risk of bias or symptom duration before intervention (Appendix 6). All of the trials were funded by industry; therefore, this subgroup analysis was not possible. To address concerns over potentially inadequate blinding to the taste of the placebo, we conducted a post hoc sensitivity analysis in which we excluded trials that reported significant differences in bad taste between zinc and placebo arms33,34 or did not report a bad taste outcome.30,35 After excluding these trials, the duration of cold symptoms still favoured zinc, with a mean difference of −1.74 days (95% CI −2.90 to −0.58). On subgroup analysis, there was no significant difference between trials with or without likelihood of blinding broken by bad taste (interaction p = 0.85) (Appendix 6). Sixteen trials reported on the severity of symptoms, but only four trials reported the data in such a way that they could be combined in the meta-analysis.31,32,36,37 When data from these trials were combined, we found no significant difference in severity of symptoms between the zinc group and the placebo group (standardized mean difference −0.27, 95% CI −0.58 to 0.05) (Figure 5). The quality of evidence was low given the substantial heterogeneity (I2 = 55%) and imprecision in the summary estimate. Meta-analysis of the severity of symptoms in randomized controlled trials of oral zinc therapy for the common cold. A value less than zero indicates a benefit from zinc. CI = confidence interval. Subgroup analyses showed that there was a significant difference in the mean severity score between children and adults (interaction p = 0.01), with children having a nonsignificant difference between the zinc and placebo groups (standardized mean difference −0.05, 95% CI −0.27 to 0.17) and adults having a significant difference favouring zinc (standardized mean difference −0.64, 95% CI −1.05 to −0.24) (Appendix 6). However, the same trials were included in the subgroup analysis by zinc formulation (all children received zinc sulfate) and in the subgroup analysis by dose of ionic zinc (all children received a low dose). Therefore, although a subgroup difference may exist, it is not clear whether age, zinc formulation or dose of ionic zinc contributed to this difference (Appendix 3). Eight trials involving 1252 patients reported the proportion of patients who were symptomatic after three days; no difference between the zinc and placebo groups was found (risk ratio [RR] 0.92, 95% CI 0.83 to 1.02). Nine trials involving 1325 patients reported the proportion of patients who were symptomatic after seven days; a significant reduction in the number was reported in the zinc arm compared with placebo group (RR 0.63, 95% CI 0.44 to 0.90). Both outcomes were associated with high heterogeneity, and the quality of evidence was considered low given this inconsistency and risk of bias in the trials. No significant subgroup effects were found (Appendix 6). 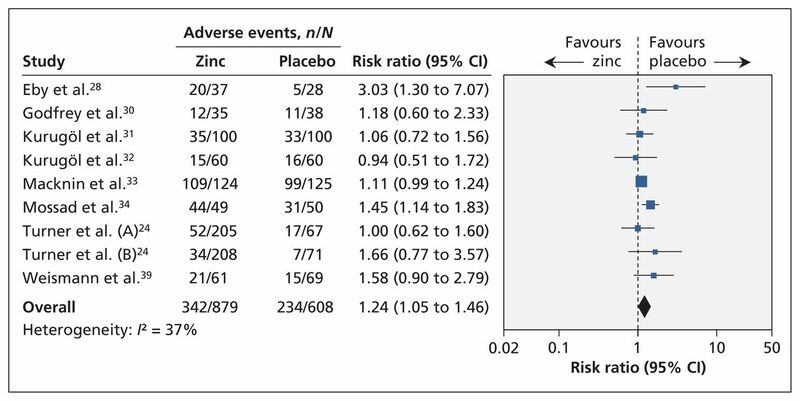 Nine trials involving 1487 patients found that the proportion of patients with any adverse events was higher in the zinc group than in the placebo group (RR 1.24, 95% CI 1.05 to 1.46) (Figure 6). Heterogeneity was moderate (I2 = 37%). Meta-analysis of adverse events in randomized controlled trials of oral zinc therapy for the common cold. A risk ratio less than zero indicates a benefit from zinc. CI = confidence interval. Patients treated with zinc more frequently experienced bad taste (eight trials, RR 1.65, 95% CI 1.27 to 2.16) and nausea (nine trials, RR 1.64, 95% CI 1.19 to 2.27). We found no difference between groups in the occurrence of abdominal pain (seven trials, RR 1.19, 95% CI 0.83 to 1.72), constipation (seven trials, RR 1.42, 95% CI 0.64 to 3.12) or diarrhea (seven trials, RR 1.88, 95% CI 0.95 to 3.72) (Appendix 7, available at www.cmaj.ca/lookup/suppl/doi:10.1503/cmaj.111990/-/DC1). When we excluded the two trials in which colds were experimentally induced,24,29 we found no significant change in the number of symptomatic participants at three days and seven days, or in the incidence of any adverse events and nausea. We found that orally administered zinc shortened the duration of cold symptoms. These findings, however, are tempered by significant heterogeneity and quality of evidence. Although there was low-quality evidence that participants receiving zinc were less likely than controls to be symptomatic at one week, there was no difference between groups in symptom severity or presence of symptoms at three days. Our findings question the importance of zinc and suggest that any benefit may be outweighed by adverse events, which were more common among participants given zinc than among controls. Our demonstration of a reduced duration of cold symptoms (mean difference −1.65 days, 95% CI −2.50 to −0.81) is consistent with the results of the most recent systematic review.11 However, the effect of zinc differed in three subgroup analyses (by age, zinc formulation and ionic zinc dose). Zinc reduced the duration of cold symptoms in adults; however, the effect was greatly attenuated and not statistically significant among children. Possible explanations include age-related differences in the host inflammatory responses,40 different viruses involved41 with varying abilities of zinc to inhibit these viruses, and consequences of third-party reporting of symptoms in children. Other possible factors include the use of lower doses of ionic zinc in the pediatric studies, as well as the use of syrup formulation (v. lozenge) and less frequent administration (resulting in less local exposure). With respect to the dose of ionic zinc and the zinc formulation, greater reductions in the duration of symptoms occurred with higher doses than with lower doses, and zinc acetate reduced the duration of symptoms whereas the other formulations showed no effect. These findings suggest a possible dose-dependent effect associated with ionic zinc and is consistent with results of a previous report showing an association between the amount of ionic zinc and the magnitude of clinical response.14 However, these characteristics only partially explain between-study differences. Our review has several other key differences from the Cochrane review.11 First, we used a different approach to estimating means and standard deviations in trials that reported only medians.32,33 In the Cochrane review, the authors calculated the means and standard deviations by assuming that the 95% CIs presented around the medians also reflected 95% CIs around the means.11 However, this approach resulted in one trial estimate showing a significant difference between the zinc and placebo groups,32 a finding inconsistent with the authors’ conclusion of no difference. In contrast, our approach enabled inclusion of effect estimates in the meta-analysis that were qualitatively consistent with the trial conclusions. The limitations of our review predominantly relate to the large heterogeneity that remained unexplained despite exploration of several subgroups a priori and the quality of reported summary data. Assumptions were made to calculate the means and standard deviations of several trial estimates, and all studies were industry funded. Although the trials reported double blinding, ineffective blinding related to taste of the placebo may have contributed to bias. Finally, the majority of trials were conducted in developed countries. We found moderate quality of evidence to suggest that orally administered zinc reduces the duration of symptoms of the common cold. However, the evidence of benefit was limited to adults, and even in this patient group, uncertainty remained about its clinical benefit. Although oral zinc treatment may attenuate the symptoms of the common cold, large high-quality trials enrolling adults and children are needed. Future trials should be designed to maximize the tolerable doses of bioavailable zinc with a balanced consideration toward potential dose-related adverse effects. Until further evidence becomes available, there is only a weak rationale for physicians to recommend zinc for the treatment of the common cold. The questionable benefits must be balanced against the potential adverse effects. The authors thank Elizabeth Uleryk for providing invaluable feedback on the literature search. They also thank Drs. Ronald B. Turner, Sherif B. Mossad and Michael Macknin for responding with additional study data. Drs. Science and Johnstone receive salary support from the Canadian Institutes for Health Research. Dr. Loeb holds the Michael DeGroote Institute for Infectious Disease Research Chair. Contributors: Michelle Science, Jennie Johnstone and Daniel Roth conceived the study. Michelle Science, Jennie Johnstone and Mark Loeb designed the study. Michelle Science and Jennie Johnstone reviewed the titles and abstracts, selected studies for full-text review, reviewed the papers for inclusion, and extracted data. Michelle Science analyzed the data and drafted the manuscript. All authors interpreted the data, reviewed the draft and approved the final version for publication. Funding: There was no dedicated funding to support this study.
. National Ambulatory Medical Care Survey: 1989 summary. Vital Health Stat 13 1992;(110):1–80.
. Rhinovirus infections in an industrial population. I. The occurrence of illness. N Engl J Med 1966;275:1261–8.
. Acute respiratory illness in an American community. The Tecumseh study. JAMA 1974;227:164–9.
. The treatment of rhinovirus infections: progress and potential. Antiviral Res 2001;49:1–14.
. Allergic rhinitis and the common cold — high cost to society. Allergy 2010;65:776–83.
. Burden of upper respiratory illnesses among college and university students: 2002–2003 and 2003–2004 cohorts. Vaccine 2006;24:6724–5.
. Productivity losses related to the common cold. J Occup Environ Med 2002;44:822–9.
. Effect of zinc salts on respiratory syncytial virus replication. Antimicrob Agents Chemother 2004;48: 783–90.
. How does zinc modify the common cold? Clinical observations and implications regarding mechanisms of action. Med Hypotheses 1996;46:295–302.
. Zinc gluconate and the common cold: a controlled clinical study. J Int Med Res 1992;20:234–46.
. Zinc for the common cold [review]. Cochrane Database Syst Rev 2011;(2):CD001364.
. Treatment of naturally acquired common colds with zinc: a structured review. Clin Infect Dis 2007;45:569–74.
. Zinc lozenges may shorten the duration of colds: a systematic review. Open Respir Med J 2011;5:51–8.
. Zinc lozenges as cure for the common cold — a review and hypothesis. Med Hypotheses 2010;74:482–92.
. Zinc and the common cold: a meta-analysis revisited. J Nutr May 2000;130(Suppl 5S):1512S–5S.
. A meta-analysis of zinc salts lozenges and the common cold. Arch Intern Med 1997;157: 2373–6.
. Zinc for the common cold [review]. Cochrane Database Syst Rev 2000;(2):CD001364. , editors. Cochrane handbook for systematic reviews of interventions. Chichester (UK); Hoboken (NJ): Wiley-Blackwell; 2008. GRADEpro [computer program]; version 3.2 for Windows. Brozek Jan, Oxman Andrew, Schunemann Holger; 2008.
. Estimating the mean and variance from the median, range, and the size of a sample. BMC Med Res Methodol 2005;5:13.
. (RevMan) [computer program]; version 5.1. Cophenhagen (Denmark): Nordic Cochrane Centre, Cochrane Collaboration; 2011.
. Is a subgroup effect believable? Updating criteria to evaluate the credibility of subgroup analyses. BMJ 2010;340:c117.
. Effect of treatment with zinc gluconate or zinc acetate on experimental and natural colds. Clin Infect Dis 2000;31:1202–8.
. Choosing the correct unit of analysis in Medical Care experiments. Med Care 1984;22:1101–14.
. Prophylaxis and treatment of rhinovirus colds with zinc gluconate lozenges. J Antimicrob Chemother 1987;20:893–901.
. Failure of effervescent zinc acetate lozenges to alter the course of upper respiratory tract infections in Australian adults. Antimicrob Agents Chemother 1987;31:1263–5.
. Reduction in duration of common colds by zinc gluconate lozenges in a double-blind study. Antimicrob Agents Chemother 1984;25:20–4.
. Two randomized controlled trials of zinc gluconate lozenge therapy of experimentally induced rhinovirus colds. Antimicrob Agents Chemother 1987; 31:1183–7.
. The prophylactic and therapeutic effectiveness of zinc sulphate on common cold in children. Acta Paediatr 2006;95:1175–81.
. Effect of zinc sulfate on common cold in children: randomized, double blind study. Pediatr Int 2007;49:842–7.
. Zinc gluconate lozenges for treating the common cold in children: a randomized controlled trial. JAMA 1998;279:1962–7.
. Zinc gluconate lozenges for treating the common cold. A randomized, double-blind, placebo-controlled study. Ann Intern Med 1996;125:81–8.
. Randomized, double-masked, placebo-controlled clinical study of the effectiveness of zinc acetate lozenges on common cold symptoms in allergy-tested subjects. Curr Ther Res Clin Exp 1998;59:595–607.
. Duration of symptoms and plasma cytokine levels in patients with the common cold treated with zinc acetate. A randomized, double-blind, placebo-controlled trial. Ann Intern Med 2000;133:245–52.
. Duration and severity of symptoms and levels of plasma interleukin-1 receptor antagonist, soluble tumor necrosis factor receptor, and adhesion molecules in patients with common cold treated with zinc acetate. J Infect Dis 2008;197:795–802.
. Failure of zinc gluconate in treatment of acute upper respiratory tract infections. Antimicrob Agents Chemother 1989;33:646–8.
. Zinc gluconate lozenges for common cold. A double-blind clinical trial. Dan Med Bull 1990;37:279–81.
. The host response, not the virus, causes the symptoms of the common cold. Clin Infect Dis 1998;26:847–8.
. Viruses and bacteria in the etiology of the common cold. J Clin Microbiol 1998;36: 539–42.